Goose Island's Bourbon County Stout is a favorite among craft beer lovers. Black Friday is a big day for shoppers looking to score a deal, but it's also significant for beer lovers. Pioneer of bourbon barrel-aged beer, Chicago's Goose Island, releases its famous Bourbon County Stout the day after Thanksgiving. In Chicago, thousands are expected to stand outside Binny's Beverage Depot to get their hands on the eight different variants available this year. Seven of the Bourbon County Stout variants will be available on tap at Philly's Goose Island Brewhouse. It opened in the Fishtown neighborhood in March. This year, orange-chocolate is a new flavor and coffee barleywine replaces coffee stout. Goose Island is expecting hundreds to show up to the timed tappings in Philly. Below is the schedule. 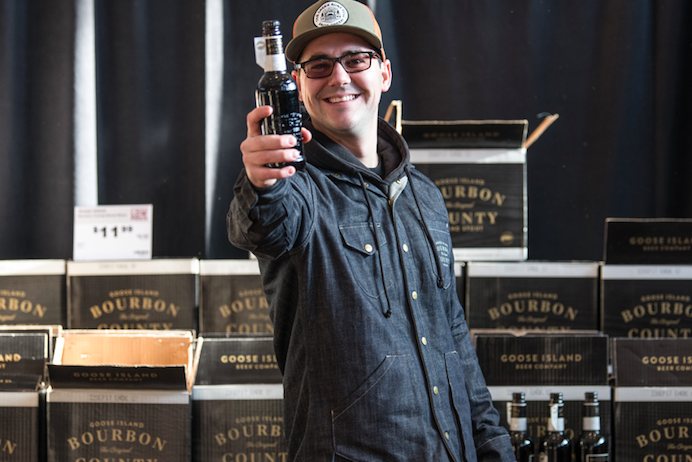 Original Bourbon County Stout and Bourbon County Wheatwine will be available all day, beginning at 10 a.m. To get the Proprietor's Bourbon County, you'll have to go to Chicago. To pair with the beers, there will be brunch specials until 3 p.m. at the Brewpub. Dishes include Bourbon County French toast, chipped beef, brisket hash, tofu scramble and a brunch burger.